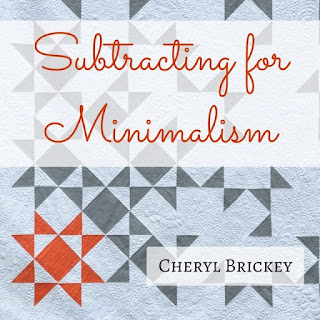 Cheryl Brickey's, new seminar, Subtracting for Minimalism, was inspirational this past Saturday, as well as, fun to watch as she walked us through her step by step process of how to remove quilt composition elements for a minimalist quilt design. Some of the classic quilt blocks (like Ohio Star (shown above), Log Cabin, Pinwheel Pop), she applied her technique and amazingly by removing parts of the whole, the quilt pattern took on a new refinement, that yes, was more minimalistic, but at the same time unique with a contemporary flair. Interestingly, for each of her examples, your eye completes the design of what should be there, while at the same time, appreciating the new design for what is not there! Note: the interpretation of this pattern is "open" to your imagination!!!!! Did you notice? 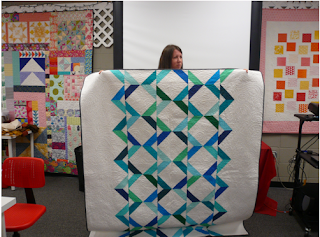 Each person who showed their quilting project(s) this month added a "unique factor" to their project. I like that....it's those personal elements that make each quilt -- one of a kind. Faye Jone's report of how GMQG Comfort quilts make a difference in children's lives is always so meaningful and touching. 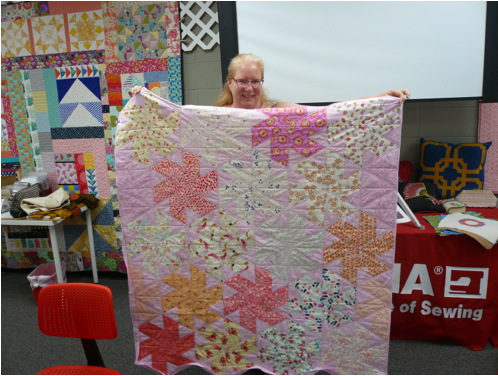 But, as she mentioned this time, even the staff are touched as they watch the children pick out a quilt to hug and hold on too. As we enter into the second half of 2017, Faye thanks each of you for your dedication to the success of our Comfort Quilts for Children. She will have four (4) quilts to take to GHS in July. Also, for those who would like to sew the GMQG label on their charity quilt, Faye and Cindy will have the labels available at each of our meetings for your convenience to pick up. 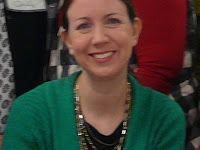 The results of June's BOM called Herringbone by designer Alissa Haight Carlton of Handmade by Alissa for Sew Mama Sew. 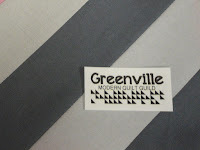 We had a couple of participants who did a wonderful job in recreating this bold and graphic design. What a fantastic turnout for July.....with 41 total attending!!! It was also great to welcome our five (5) guests. Thank you Paige for your update report to us. 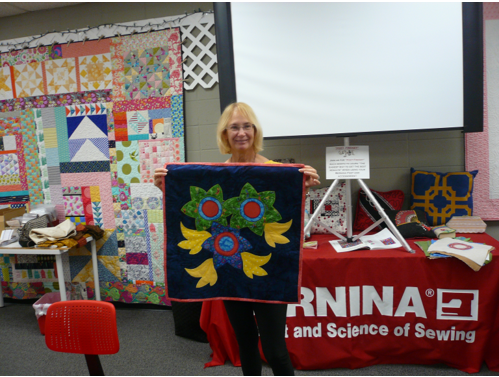 Check-out Bernina Sewing Center July calendar for sewing and quilting classes. 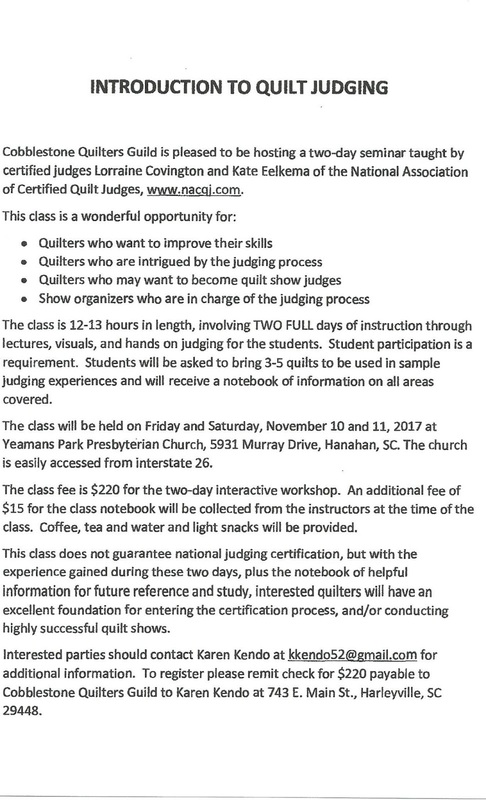 Aunt Het Quilt Show, October 7-8, 2017 has a new category for modern quilts. 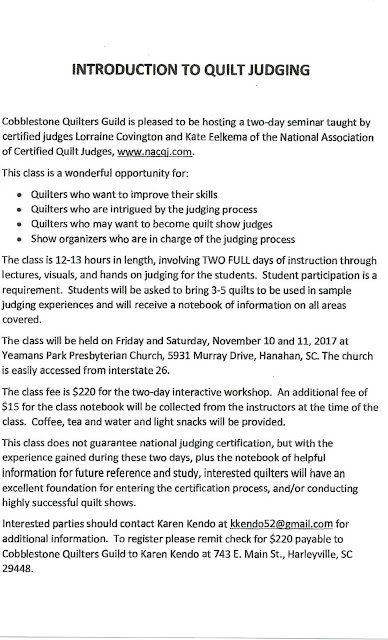 The hosts of the show, Nimble Thimble Quilt Guild, has invited GMQG members to consider entering quilts in this category. The registration form and deadline for the show is September 1, 2017. For those that enter the show, Faye Jones has volunteered to take our quilts to the show as well as bring them back. 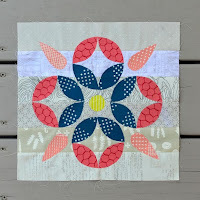 Michael Miller - Our Yard Fabric Challenge. 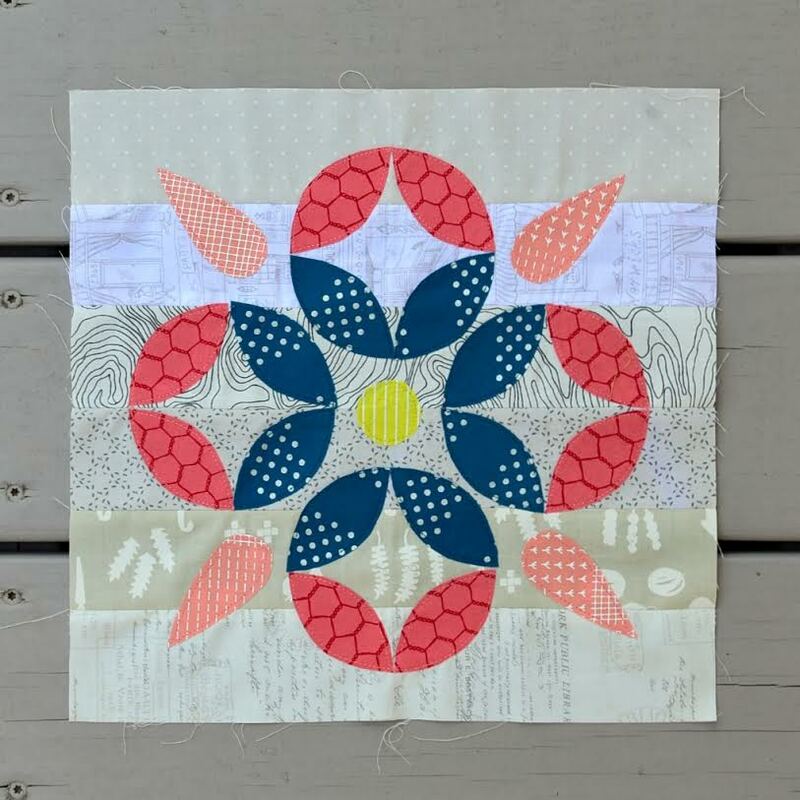 American Patchwork & Quilting Flying Geese. Cindy Lammon shared with us the opportunity to participate with Bernina Sewing Center in "Global Journey" a special formed group of 20 quilters from the USA and other countries who will be visiting Greenville next May 25, 2018. The goal of the group is to experience the uniqueness of the area through local residents and quilters like ourselves. Here is the website to learn more about this program called Friendship Force Western North Carolina. We will keep you posted as this event nears next year. We hope you continue to enjoy your summer and be inspired by the adventures and outings you take. Go ahead and save-the-date for next month's meeting on August 12th.